A Northwestern fencer parries an attack. The Wildcats will be looking to snag the Midwest Fencing Conference Championship this weekend. First, it was the win-streak record. Then, it was the single-season wins record. This weekend, Northwestern will have the opportunity to add another major achievement to its list this season: conference champions. The No. 9 Wildcats will be in Columbus, Ohio, this weekend competing at the Midwest Fencing Conference Championship. Although there are 19 teams in the conference, only two teams are expected to battle for the title of MFC Champions: NU and Ohio State. The Cats and the No. 4 Buckeyes, who won the 2017 MFC team title, split two regular season meetings. At the Elite Invitational in November, NU defeated Ohio State 15-12, while the Buckeyes won 18-9 earlier this month at NU Duals. There are seven titles on the line at the championship: team and individual titles in epee, foil and sabre, and an overall team title. The Buckeyes won two squad titles and swept the three individual tiles last season. However, two of the three individual winners graduated, and Buckeyes sophomore sabre Sarah Merza is the only returning champion. The only title the Cats won at last year’s MFC championship was the epee team championship, its third consecutive triumph in that classification. In the individual epee competition, which Moss said any of the Cats have a chance of succeeding in, NU returns five of the top seven finishers in last year’s competition: junior Ella Lombard (2nd), senior Katie Van Riper (4th), sophomore Pauline Hamilton (5th), senior Anna Tolley (6th) and sophomore Adelle Berdichevsky (7th). 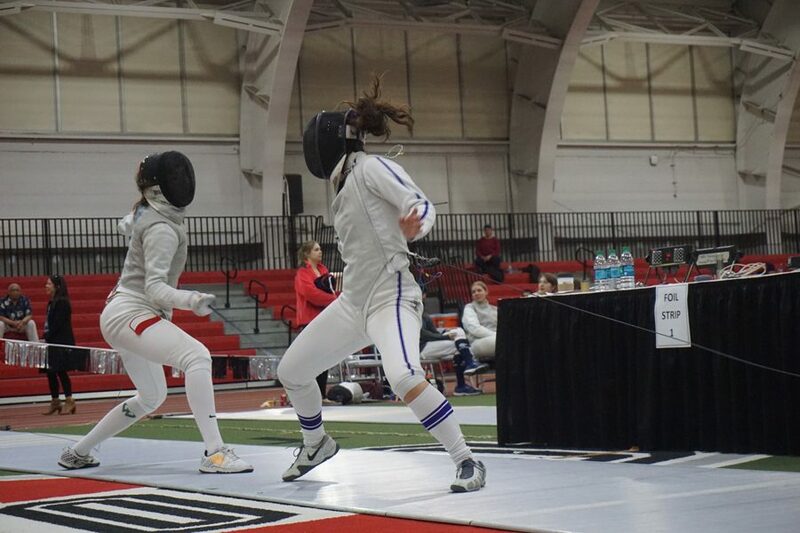 Lombard, who was NU’s highest-finishing fencer at last year’s MFC championship, said she is excited to see all of her squad mates fence. However, Hamilton, who is coming off of a fifth-place finish at the Junior Olympics, is one who particularly sticks out. Epee is not the only squad where there are multiple fencers vying for medals. In foil, junior Yvonne Chart looks to improve upon her third-place finishes in 2017 and 2016 this weekend. Three fencers who finished in the top 11 — junior Sharon Chen and sophomores Alexandra Banin and Amy Jia — return this year, while freshmen Justine Banbury and Sarah Filby will look to add to their impressive rookie campaigns. The best returning finisher in sabre is junior Maddy Curzon, who tied for third place last year. Following Curzon is senior Emine Yücel, who finished seventh in 2017, and senior Sacha Bazzal, who slumped to 11th last season after finishing in the top ten in 2016. The foil team has not won an MFC championship title since 2012, and an individual foilist has not won an individual title since Sam Nemecek in 2009. The sabre squad last won a team championship in 2016. Freshman sabre Alexis Browne said that being focused will be a key to success for the Cats over the weekend. Lombard added that the championships are one of the most fun and spirited competitions of the year and that having outstanding energy and team spirit leads to success all-around.